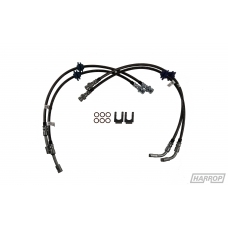 A stainless steel braided brake hose kit is an improvement for any brake system and a must for those with one of our high performance Harrop brake kits. 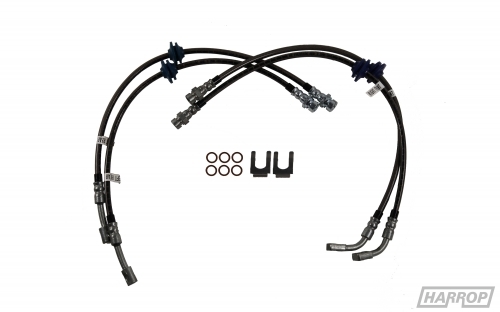 Stainless steel braided line was chosen in order to eliminate performance loses due to the standard brake line expansion, when this happens brake pedal sensitivity decreases and the braking distances increase. Rubber hoses will deteriorate over time and can become brittle and eventually fail, manufacturers recommended that all original rubber hoses should be changed every 4 years to avoid this situation. If you are going to fit one of our high performance brake kits to your vehicle then these lines are an absolute must to achieve the maximum performance form your vehicles braking system. Vehicle Applications: Ford Falcon Sedan, FG including FPV variants.